What Is Printer Potty And How Will It Save Me Money? I thought I was looking at replacing my printer and paying out £130+ until I found [this product]. Now I’m up and running again for less than £15. A simple but very effective product. Should have had one years ago!! Product arrived promptly and was exactly as described. It works wonderfully and I am now able to use my Epson Stylus Photo 1400 again. What a lifesaver. Printer Potty waste kits have been around since 2008 and while the name is relatively new, our products are based on hard won experience from years of direct use and from supporting our customers. A new printer means new choices (Which one do you buy? ), new drivers (How does this install again? ), new location (What do you mean it doesn't fit?! ), new functions (Instructions? I'm sure it was here somewhere). Keep you old one! Time included. You don't throw out a baby for the sake of a full nappy so why not Potty train your printer and make use of your printers true working life and get as much as three times more printing, work and value for money. Even recycling wastes energy, increases pollution and often printers just end up in the landfill anyway. Yes, it will have to go to printer heaven one day but every time you revive rather than recycle, you keep another new printer out of this environmental spiral. Not perfection, but the right direction. A Printer Potty revives your existing printer. That means no trip to the store, no new printer, no new inks and no trip to dispose of your existing printer. As little as £25 spent. As much as £600 saved! Originally our product range was built around the idea of printer owners with divergent needs differing needs but as our products approach their 9th year under the “Printer Potty” brand we’ve found a more organic separation than we’d anticipated. 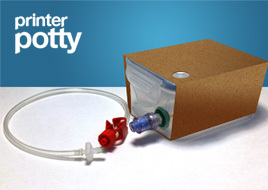 Our baseline Printer Potty kits provide everything you need to revive the smaller desktop models on a budget and covers the bulk of Epson printer designs. Originally for A3+ Photo inkjet printers, the Printer Potty Pro offers refinements to improve ease of installation and the tools to achieve it. With high cost printers such as the EcoTank series, our Pro model provides a kit that covers all the bases, higher volumes of waste ink, and includes an enhanced two year warranty as standard.